In 1933 a cottage in Great Ayton, Yorkshire which had belonged to Captain Cook's parents came on the market. This aroused great interest in Australia, and soon Russell Grimwade (a local scientist, businessman and philanthropist) had agreed to purchase it for Victoria and have it transported to Melbourne. After some debate about where the cottage should be rebuilt and for what purpose it should be used, the current location of the Fitzroy Gardens was decided upon. The dismantled cottage arrived in Melbourne in April 1934 and was opened in October that year. Over one of the doorways is the inscription "JGC 1755" (James and Grace Cook - the parents of Captain James Cook). Did Captain Cook spend his boyhood in that cottage? If the date 1755 indicates the year in which it was built or purchased by his parents then the answer is no. Cook was then aged twenty-seven and had long since left Great Ayrton to become a seaman. If, as is possible, the date indicated the year in which his parents rebuilt the cottage then he may have spent some of his boyhood between the age of eight and seventeen there. Did Captain Cook know the cottage? Yes - we know he visited his father there in 1772. However the cottage has been modified and practically rebuilt a number of times, and it may be that the beam with the inscription is the only feature dating back to Cook’s parents’ time. In the end, it doesn't particularly matter whether he lived there or not, It is a tangible reminder of the sort of cottage and humble surroundings from which one of the world's great navigators came, and most Melburnians still refer to it as ‘Captains Cook's Cottage’. It quickly became a favourite with tourists and locals and is one of Melbourne's most visited attractions. It contains numbers of displays associated with the life of Captain James Cook. 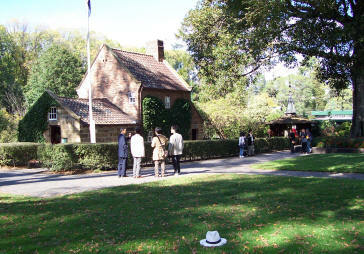 As it stands, Cooks’ Cottage is the oldest European-style building in Australia. On the other hand, for the oldest surviving indigenous stone houses in Australia and some of the oldest surviving infrastructure in the world you can venture to BudjBim in South West Victoria.